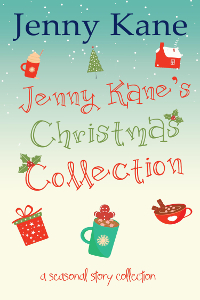 I’m delighted to say that, from today, you can purchase my ‘Jenny Kane’s Christmas Collection’ as a trilogy in PAPERBACK. To mark this occasion, I’ve been thinking about the features that unite each of the stories within the trilogy. Naturally, the characters all have a connection to the Pickwicks coffee shop in Richmond; then there’s the coffee, the hint of romance, the element of adventure, and the hurdles of life that need to be overcome before Christmas can arrive- and then there’s the food. 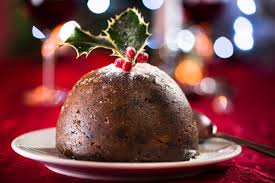 The food at Christmas is so important- it has that special feel good, warming factor- that really sums up the season, with its hints of cinnamon and nutmeg, mulled wine and Christmas puddings, and then there are the mince pies. My Grandad was often heard to say “Christmas isn’t Christmas without a mince pie,” usually while trying to persuade my Nan that he really was allowed to pinch another one off the mountain she’d made in readiness for the WI Christmas party…he didn’t always get far on that! Anyway- it got me to thinking. A mince pie is actually a rather weird thing. When did we start eating them? 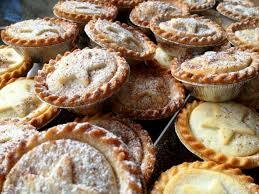 So, just for you, here is a very potted history of the origins of the mince pie! 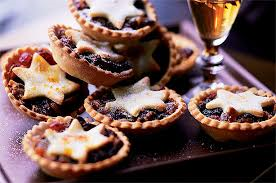 The earliest mince pie in the UK can be traced back to the 13th century, when it was amongst many of the recipes returning European crusaders brought with them back from the Middle Eastern crusades. This first recipes contained meats, fruits and spices, all wrapped in a large pastry pie crust. In the fourteenth century work, Forme of Cury there is a recipe for Tart of Flesh, which contains figs, raisins, wine, pine kernels, lard, cheese, minced pork, honey and spices. A similar recipe using mutton rather than pork is also given in The English Huswife in 1615. These recipes formed the origins of what was to become the mince pie we recognize today. Mince pies were only for special occasions, such as Easter and Christmas, because the ingredients were so costly. Unlike the circular shape we are used to, these pies were first made in an oval shape to represent the manger that Jesus slept in as a baby, with the loose fitting top placed over the mixture, representing his swaddling clothes. Although it is a myth that Oliver Cromwell banned mince pies during his period in power after the English Civil War, it was at this time that the pies stopped copying the shape of Jesus’ manager, and adopted the more recognisable circular form. During the Stuart and Georgian times, mince pies were a status symbol, with only the rich being able to afford them. The wealthy liked to show off at Christmas parties by having pies made is different shapes, like stars or hearts. It is unknown when meat was finally removed from the mince pie recipe. It was still included in 1845, when Eliza Acton wrote ‘Modern Cookery for Private Families, but in 1861, Mrs. Beaton was recording two recipes different recipes for mince pies, on with meat and one without.